When you’re ready to upgrade to OS X Leopard (10.5), you will need to decide what type of installation to perform. OS X 10.5 offers three types of installation: Upgrade, Archive and Install, and Erase and Install. The last option, Erase and Install, is also known as a clean install because it fully erases the selected drive volume before installing OS X 10.5. The advantage of Erase and Install is that it allows you to start fresh leaving behind any debris from previous versions. The Erase and Install option should, therefore, offer the cleanest, smallest, and best performing version of OS X 10.5. It can also be the quickest install when you are purposely creating a fresh install with no user data to restore. For example, if you’re handing down your computer to other family members, you might not want them to have access to your old information. Of course, there are downsides to using Erase and Install, particularly if you do intend to restore your user data. Unless you make advance preparations, the erase process will wipe out all of your data. If you want to restore your user data, you’ll need to first create a backup of your existing startup drive, so you can selectively reinstall the data you need after you install OS X 10.5. 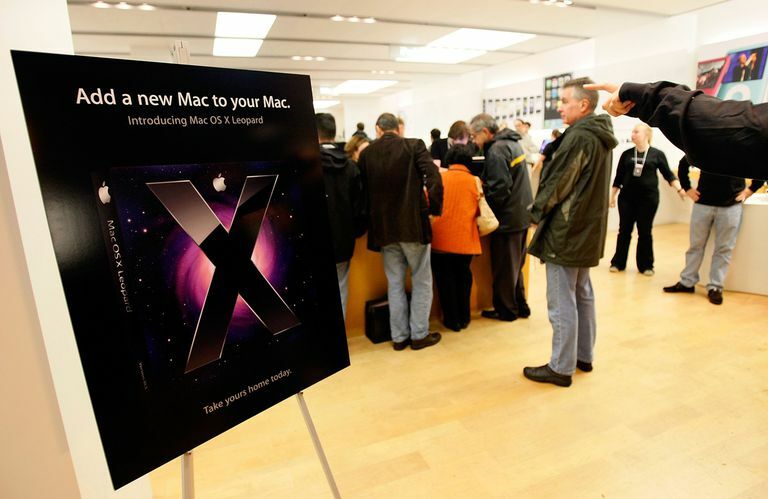 If you’re ready to perform an Erase and Install of OS X 10.5, then gather up the necessary items needed to get started. A Mac with a G4, G5, or Intel processor, 512 MB of RAM, a DVD drive, and at least 9 GB of free space. A Mac OS X 10.5 Leopard Install DVD. A half hour to two hours of time. The amount of time the installation will take depends on the type of Mac you’re installing OS X 10.5 on. Installing OS X Leopard requires you to boot from the Leopard Install DVD. There are multiple ways to start this boot process, including a method for when you’re unable to access your Mac’s desktop. Insert the OS X 10.5 Leopard Install DVD into your Mac’s DVD drive. After a few moments, a Mac OS X Install DVD window will open. When the Install Mac OS X window opens, click the ‘Restart’ button. Enter your administrator password, and click the ‘OK’ button. Your Mac will restart and boot from the installation DVD. Restarting from the DVD can take a little while, so be patient. After it restarts, your Mac will guide you through the installation process. Although the guided instructions are usually all you’ll need for a successful installation, we’re going to take a little detour and use Apple’s Disk Utility to make sure that your hard drive is up to snuff before you install your new Leopard OS. Select the main language OS X Leopard should use, and click the right-facing arrow. The Welcome window will display, offering to guide you through the installation. Select ‘Disk Utility’ from the Utilities menu located at the top of the display. When Disk Utility opens, select the hard drive volume you wish to use for the Leopard installation. Select the ‘First Aid’ tab. Once the verification and repair are complete, select ‘Quit Disk Utility’ from the Disk Utility menu. You will be returned to the Welcome window of the Leopard installer. Click the ‘Continue’ button to proceed with the installation. OS X 10.5 Leopard has multiple installation options, including Upgrade Mac OS X, Archive and Install, and Erase and Install. This tutorial will guide you through the Erase and Install option. OS X 10.5 Leopard offers installation options that allow you to select the type of installation and the hard drive volume to install the operating system on, as well as customize the software packages that are actually installed. While there are lots of options available, I’ll take you through the basics to complete the Erase and Install of Leopard. When you completed the last step, you were shown Leopard’s license terms. Click the ‘Agree’ button to proceed. The Select a Destination window will display, listing all of the hard drive volumes that the OS X 10.5 installer was able to find on your Mac. Select the hard drive volume you wish to install OS X 10.5 on. You can select any of the volumes listed, including any that have a yellow warning sign. Click the ‘Options’ button (later versions of the OS X installer changed the option button to Customize). The Options window will display the three types of installations that can be performed: Upgrade Mac OS X, Archive and Install, and Erase and Install. This tutorial assumes that you will choose Erase and Install. If you don’t intend to erase the selected hard drive volume, do not proceed any further with this tutorial, because all of the data on the selected hard drive volume will be lost during the installation. 7. Use the ‘Format disk as’ drop-down menu to set the formatting options to ‘Mac OS X Extended (Journaled).’ Click the ‘Continue’ button to erase and format the selected hard drive volume. During the installation of OS X 10.5 Leopard, you can choose the software packages that will be installed. The OS X 10.5 Leopard installer will display a summary of what will be installed. Click the ‘Customize’ button. A list of the software packages that will be installed will display. Two of the packages (Printer Drivers and Language Translations) can be pared down to reduce the amount of space needed for the installation. On the other hand, if you have plenty of storage space, you can just leave the software package selections as is. Click the expansion triangle next to Printer Drivers and Language Translation. Remove the check marks from any printer drivers you don’t need. If you have plenty of hard drive space, you should install all of the drivers. This will make it easy to change printers in the future, without worrying about installing additional drivers. If space is tight and you must remove some printer drivers, select the ones you’re most unlikely to use. Remove the check marks from any languages you don’t need. Most users can safely remove all of the languages, but if you need to view documents or web sites in other languages, be sure to leave those languages selected. Click the ‘Done’ button to return to the Install Summary window. The installation will begin by checking the install DVD, to make sure it’s free of errors. This process can take some time. Once the check is finished, the actual installation process will begin. A progress bar will display, with an estimate of the time remaining. The time estimate may seem much too long to begin with, but as progress occurs, the estimate will become more realistic. When the installation is complete, your Mac will automatically restart. With the installation completed, the OS X 10.5 Leopard Setup Assistant will start by displaying a ‘Welcome to Leopard’ movie. When the short movie is completed, you’ll be directed through the setup process, where you will register your installation of OS X, and be offered the option to transfer account and user data from another computer. You don't have to use an Apple-supplied keyboard; most Windows-based keyboards will work just fine. The Setup Assistant will walk you through the process of determining the type of keyboard you have. The Keyboard Setup window will display. Click the ‘OK’ button to start the keyboard detection process. Press the key to the right of the shift key that is located on the left side of your keyboard. Press the key to the left of the shift key that is located on the right side of your keyboard. Your keyboard type will be identified. Click ‘Continue’ to proceed. From the list, select the country or region where you will be using your Mac. From the list, select the keyboard layout you wish to use. Enter your Apple ID and password. This information is optional; you can leave the fields blank if you wish. Enter your registration information, and click the ‘Continue’ button. Use the drop-down menus to tell Apple’s marketing folks where and why you use your Mac. Click the ‘Continue’ button. Click the ‘Continue’ button to send your registration information to Apple. Your Mac needs at least one administrator account. At this point in the setup process, you will be asked to create the first user account, which will also be the administrator account. Enter your name in the ‘Name’ field. You can use spaces, capital letters, and punctuation. This will be your account username. Enter a short name in the ‘Short Name’ field. OS X uses the short name as the name for your Home directory, and for the internal user account information used by various system tools. The short name is limited to 255 lower case characters, with no spaces allowed. Although you can use up to 255 characters, try to keep the name short. The most common methods are to lowercase a full name (for example, tomnelson), or to use a first initial and last name (for example, tnelson). Short names are very difficult to change once they’ve been created, so be sure that you’re happy with the short name you create before you continue. Enter a password for the administrator account. Optionally, you can enter a descriptive hint about the password in the ‘Password Hint’ field. This should be something that will jog your memory if you forget your password. Do not enter the actual password. Select a picture from the list of available images. This picture will be associated with your user account and will appear during login and other events while you’re using your Mac. If you have an iSight or a compatible webcam connected to your Mac, you will be offered the option to use the webcam to take your picture and to use that image with your account. Make your selection, and click the ‘Continue’ button. You’re just about done with the OS X setup utility, and you’re only a few clicks away from accessing your new OS and its desktop. But first, you can decide whether to create a .Mac account. .Mac accounts are no longer supported having been replaced by iCloud, so you may want to skip past this section. Your Mac has finished setting up OS X Leopard, but there’s one last button to click. You will be automatically logged in with the administrator account you created earlier, and the desktop will display. Take a good look at your desktop in its pristine state, because if you’re like many users, it will never look this clean and organized again. Have fun with your new Leopard OS!